Explore custom solutions with Frank Lowe. Contact the furniture parts manufacturing team at Frank Lowe. We offer custom, engineered solutions to manufacturers of furniture and appliances throughout the world. Whether you’re looking for high-quality rubber bumpers, thermal insulation, or packaging component, Frank Lowe will meet your needs and exceed your expectations. At Frank Lowe, our furniture components manufacturing team provides one-of-a-kind solutions. With each custom furniture part or appliance part, we instill more than six decades of design and engineering expertise. We utilize state-of-the-art equipment, which enables us to quickly meet orders of all sizes. Once your order has been produced, we offer a variety of customizable distribution services to ensure you have your order on time. 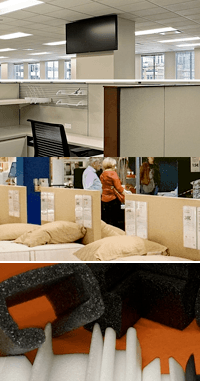 Whether you need blind drop shipments or expedited just-in-time orders, the expert furniture part manufacturers at Frank Lowe are here to help. Explore all furniture component solutions and possible materials — including ones you may have never considered. Pursue each option through a cost-benefit analysis and stress test it against your budget. Create the most viable option to enhance your product, create manufacturing efficiencies, and or create a competitive advantage. Let’s talk. We’re ready to listen. Contact the expert furniture components manufacturing team at Frank Lowe today. Not sure about the exact materials or specs required for your furniture component product application? Let's chat. We'll help you find the right solution. Are You Using the Right Materials For Your Furniture Product Application? Let's talk. We'll help you choose the right materials for your furniture component product application.